Chickens become sexually mature between 4 and 6 months of age. With proper care and excellent nutrition the first egg is laid soon. You should still be feeding Purina® Start & Grow® Recipe to your birds. A layer diet should not be fed until 18 weeks of age because of the high calcium levels which are inappropriate for younger birds. Be sure to gradually transition the birds from the starter feed to the layer feed over 7 to 10 days. Remember to always provide fresh water. Water is essential for healthy chickens, not to mention future egg production. As the weather gets warmer, they will drink more water so make sure they have access to a never-ending supply. Purina® Scratch Grainscan be introduced to your flock after 12 weeks of age. This natural, all grain supplement should be fed along with a complete and balanced diet and should not make up more than 5 to 10 percent of the total daily intake. If you feed Purina® Scratch Grains, your birds should also have access to “grit.” Grit is made up of small insoluble granite particles, which assist in digestion of feed by helping to grind it up in the gizzard. Feed 1 pound per 100 birds, twice per week either mixed with other feed or free choice. Remember to provide your pullets with 17 to 18 hours of light per day starting at 16 weeks of age. At about four and a half months, you’re probably anxiously awaiting the fruits of your labor wholesome eggs. Now is the time to introduce your laying pullets to Purina® Layena® Sunfresh® Recipe or Purina® Layena® Recipe Plus Omega-3 to insure that they receive the best nutrition to support egg production. Purina® Layena® Recipe Plus Omega-3 has added flaxseed, which helps your chickens to produce with enhanced levels of Omega-3. Each egg will contain 300 percent more Omega-3, an essential fatty acid. At this point, you’ve probably already been enjoying eggs for a while now. If you find that those first eggs are small, misshapen or have weak shells, don’t worry, practice makes perfect and as time goes by the eggs will become more consistent. 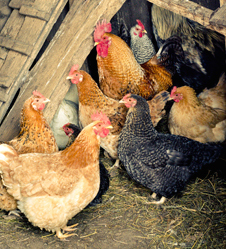 Pullets usually start laying around 20 weeks of age with peak production occurring around 27 to 30 weeks of age. Peak production means that it is the highest rate of lay in your flock. Excellent peak production during this time would be between 80 to 90 percent. This means that on a given day, 80-90 percent of your birds will lay an egg. Nutrition, housing conditions, weather, breed and lighting, as well as management will all play a part in how many eggs each pullet will lay. You should gather eggs frequently, at least three times per day. This is particularly important during hot weather. Eggs that will be used for eating should be refrigerated. Frequent collection and refrigeration keeps the eggs fresher, cleaner and decreases the chance for broken eggs. Eggs intended to be used for hatching should be stored at 55°F and 70 to 75 percent humidity. When maintained at the correct temperature hatching eggs can be stored for up to 6 days with no effect on hatchability. After peak production occurs, the rate of lay will decrease by about 1 to 1.5 percent each week. Following 10 to 14 months of laying eggs, the pullet’s rate of lay will be very low and molting may occur. Continue feeding Purina® Layena® Sunfresh® Recipe free-choice and be sure there is always fresh water available. At seven months, egg production in your flock should be well established and you may be experiencing peak production at this time. Maintain good management practices to ensure the health of your birds throughout the laying cycle. Don’t be surprised if you notice your pullets start to lose their feathers. Molting is a normal process when feathers are lost and replaced by new ones. When pullets lose all their feathers, it is called a full molt. Others may only lose some of their feathers, usually around their neck, which is a partial molt. During molting, a bird will go out of production. This period gives the reproductive tract time to rest after the stress of many months of producing eggs. After molting, egg production resumes about 8 to 12 weeks later. Once they return to production, the rate of lay is about 10 percent less than the first cycle. However, the eggs are usually larger with stronger shells. Although molting occurs naturally after 10 to 14 months of egg production, it can also be caused accidentally as the result of stress due to disease, extreme temperatures, decrease in light exposure, and a lack of feed and/or water. This entry was posted on Wednesday, May 20th, 2015 at 4:28 pm	and is filed under News & Updates. You can follow any responses to this entry through the RSS 2.0 feed. Both comments and pings are currently closed.